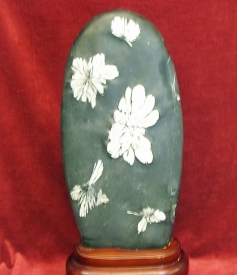 CHRYSANTHEMUM STONES FORMED150 MYA (MESOZOIC ERA) CREATING "CHRYSANTHEMUM STONE FLOWERS" IN THE BOGS RICH IN VEGETATION AND MINERALS. 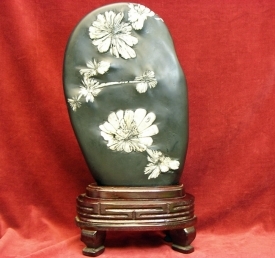 OVER THE MANY YEARS, WITH HEAT AND PRESSURE, THESE CHRYSANTHEMUM STONE FLOWERS WERE NOW IN BLACK LIMESTONE. WEATHERING, UPHEAVALS, AND WATER FLOWS FORMED THE LIMESTONE INTO BOULDERS. THE CHINESE STONEWORKERS SPLIT THESE BOULDERS OPEN REVEILING THE ROUGH SHAPED CELESTITE STONE FLOWERS. 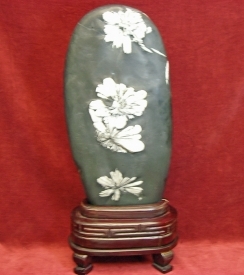 WITH THE USE OF HAND TOOLS, DRILLS, AND POLISHERS, THE LOCAL CHINESE ARTISANS REMOVED THE LIMESTONE FROM AROUND THE FLOWERS CREATING SHARP, CLEAN, 3-D DISPLAYS DISPLAYS. 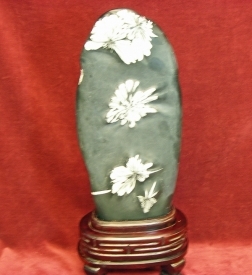 CELESTITE IS A STRONTIUM SULFIDE MINERAL FORMING THE FLOWER. THESE ARE FROM THE HUNAN PROVINCE AND XUANEN, HUBEI PROVINCES, CHINA. 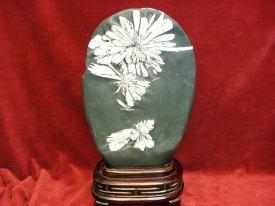 THESE CHRYSANTHEMUM STONE FLOWERS ARE THE WAY THEY FORMED OVER A MILLION YEARS AGO. 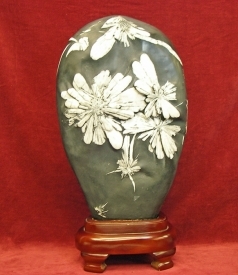 THEY ARE NOT PAINTED OR DYED, JUST ENHANCED THROUGH THE HARD AND EXPERT WORK OF THE CHINESE ARTISANS.